Mobile Edge SmartPack Backpack - TealThe SmartPack is a no-nonsense backpack ergonomically designed, and super lightweight. This stylish backpack not only offers laptop and tablet protection, but provides ample space for books, files and accessories needed to stay productive. The padded and moisture wicking ventilated back panel, thick shoulder straps, and carrying handle make carrying the bag for longer periods of time comfortable. The side mesh pockets are the precise size for water bottles. 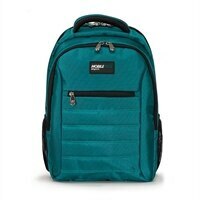 Its water-resistant and rugged 1680D nylon exterior will keep the SmartPack looking new for years to come. Designed to carry laptops with screens up to 15.6-inch comes complete with an additional MicroFiber lined pouch for a tablet. The SmartPack is a no-nonsense backpack ergonomically designed, and super lightweight. This stylish backpack not only offers laptop and tablet protection, but provides ample space for books, files and accessories needed to stay productive. The padded and moisture wicking ventilated back panel, thick shoulder straps, and carrying handle make carrying the bag for longer periods of time comfortable. The side mesh pockets are the precise size for water bottles. Its water-resistant and rugged 1680D nylon exterior will keep the SmartPack looking new for years to come. Designed to carry laptops with screens up to 15.6-inch comes complete with an additional MicroFiber lined pouch for a tablet.